Found a way to add fully working airtransports into maps using the discoveries made in this topic. By "into maps" I mean they cannot be controlled by a human, they must follow a script to work. The basic idea is giving the aircraft Landable=no as mentioned in the other topic. 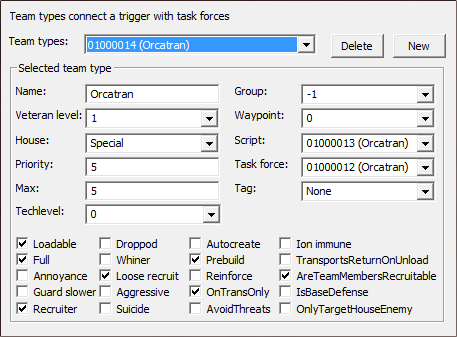 Now, simply create a taskforce / script / team / trigger with the air transport. It needs to be owned by an allied faction, so for skirmish maps make the owner Special. The team needs to have the Loadable property enabled (so that's what it's meant for...). If Loadable is not enabled, infantry can't enter the transport. The transport will land just fine, with or without passengers in it. But it cannot belong to a human controlled house, as soon as you make it swap sides the transport refuses to land with people inside. Not to mention it becomes unselectable (unless you EMP it and select it right away). So this trick can only be used for mapping purposes. EDIT: I had to use the trigger action 80 Reinforcement (team) [at waypoint]... to spawn the transport into the map. I couldn't get a pre-placed transport to be recruited into the team. This might make it impossible to make the transport swap teams by triggers. Though maybe I just messed something up, it might be possible to recruit it into other teams. Interesting find. I've actually never tried doing this, so I never knew there were any issues with allow civilian owned aircraft to carry infantry. ok, it seems that the fake weapon isn't required either. I recall it being required to make an empty transport land, but that must have been for human controlled airtransports. Updating the original post now. What's currently left of the method is actually how I'd do it to begin with when I'd try it, so it's not really a work-around anymore. And yeah, recall having tried quite a few things to recruit an aircraft that was placed on a map into a team, but nothing I tried worked... So recruiting aircraft into teams is probably impossible. The Landable=no thing is still bit hacky, and not outright obvious (we only discovered it fairly recently). Without it the neutral airtransport will get the bug that human controlled airtransports get. This is a horrible bug that affects ai.ini as well. Anyone who has tried to make AI air attacks has probably noticed how the AI doesn't consider landed aircraft recruitable for teams. Only aircraft that are in the air can be recruited for teams. With that in mind I did manage to get the neutral aircraft to swap teams, but it had to be in the air while the old team was deleted and the new team created (with a trigger). Annoying and can put some limitations into this. E.g. you can't make an airtransport land somewhere, wait to be filled up, and only then fly off. On one of my DTA maps i placed a Special house Chinook on the map and then recruited it just fine with the Create Team trigger. Though maybe it's a special case here, since the DTA Chinook is using the Carryall workaround. Are you sure? I gave the ORCATRAN Carryall=yes and it behaves like a human airtransport (unloads 1 unit at a time). I also still can't get landed aircraft recruited, not even with a Group=X value on the team and the unit on the map. As soon as the aircraft is in the air it can be recruited. 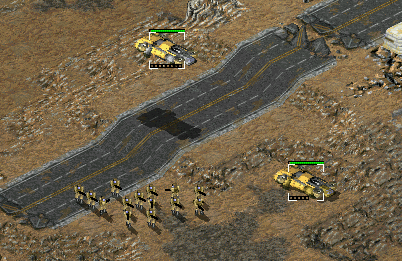 IIRC Team Black's Seige City map had air transports that when you loaded infantry into them, they would fly to the next designated spot on the map and unload your infantry. I believe he used both the orca transport and the Chinook graphics for this...not sure what coding edits he did, if any, to them. But might be worth taking a look at as well to see what he did. He is using the jumpjet locomotor on the aircraft. The problem(s) must lie in the aircraft locomotor. Actually using the jumpjet loco on the airtransport is not a bad idea, even if it makes the transport invulnerable. They could still be used for objectives in a singleplayer mission, where the transport is not even supposed to be destroyed. You could still blow it up with a trigger or script if needed. Btw I just ran into the most mind blowing bug in TS I've seen yet. In the picture below you can see 2 orca transports (the exact same unit). But one of them can only carry 5 people, the other 8 (both should be able to carry 8 ). The landed transport that can only carry 5, can only be selected and ordered to move after I have first selected the other transport. And the other transport can only be selected while it's in the air. Guess Carryall=yes and Landable=no don't mix together too well The other transport was placed directly on the map, the other spawned with a trigger. This is probably what causes them to be different. It still makes absolutely no sense though. If they're the same, how did you make them have different pipscale? It's not just different pipscale visually, the other transport can physically only take in 5 people, while the other 8. I have no idea how 2 of the exact same unit can be different. That's the mind blowing part. Oh you TS, you so crazy. Also give the team the properties shown in the pic below (might not need them all). With this the transport will wait until it is (fully) loaded with people, then fly them to the target waypoint, unload, return, and start over. Haven't figured out a way to send a non-fully loaded transport on it's way, since the transport can't be recruited into another team while it's on the ground (at least, I still can't get it done). EDIT: Just to clarify, you can either use the script / team in the first post to create a transport that keeps doing runs regardless if there are people in the craft or not. Or you can use the script / team in this post to make the craft wait until it is fully loaded, then do the run. Maybe someone can figure out a clever way (a trigger) to make the aircraft fly off at your command. For me, I just put Loadable on and full on for air transport to come from the map. OH TS!!! This is the reason why I enjoy modding you!!!!! I did originally try aircraft locos for the Siege City air transports. I put an invisible lamp post where their landing zones were, which seemed to help them to land. I can't recall how well that worked, but in any case I switched to the jj loco since it was more foolproof.